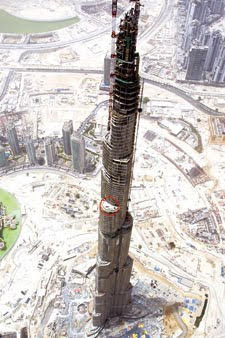 At 828m in height, the iconic Burj Khalifa (formally known as the Burj Dubai) has broken many world records since its completion, including, the installation of the highest revolving doors in the world. Boon Edam UAE distributor, Mace Trading LLC, has installed six revolving doors on this record breaking iconic building, two of which are situated on the 124th floor, leading out to the viewing gallery. At this level, our transparent bespoke Crystal Tourniket revolving doors fit perfectly into the façade, allowing spectators to observe the spectacular view over Dubai. 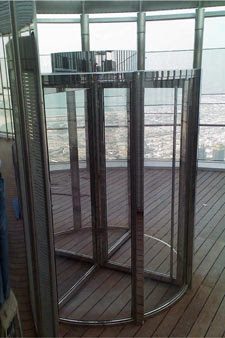 At a height of 442m, this revolving door has been specially engineered to withstand extreme weather conditions and high wind loading. Boon Edam has a proud heritage of producing energy efficient products. Acknowledged as the world market leader in Revolving Doors, for over 100 years, our revolving doors have been helping conserving energy by reducing building energy loss and preventing draughts.